How to deal with the coming volatility. The second round of quantitative easing ends in June. Quantitative easing was the Federal Reserve's attempt to boost the economy by purchasing long-term Treasury bonds -- prominently derided as "money printing." So what does this all mean for investors? Frankly, no one knows for certain, but there's plenty of speculation we could be in for a rude awakening. Blogger Chris Martenson sees a big storm ripping through the markets, writing: "The end of QE2 is going to be a complete disaster for the paper markets." Commodity prices have indeed been falling. Oil and copper are down from their highs, and silver isn't getting any respect today. Is this the beginning of Martenson's predicted end? That's unclear. Silver Wheaton (NYSE: SLW) CEO Randy Smallwood would probably see silver's fall as a great buying opportunity, not a canary in the coal mine. He believes precious metals will continue to rise as investors lose faith in paper currencies. Well that's encouraging! Other expert opinions run the gamut. BlackRock equity strategist Bob Doll says the end of QE2 should be a non-event, while Jeremy Grantham recently recommended selling riskier assets. So it makes sense to have our own plan for how to deal with the likely volatility. After all, the S&P 500 dropped more than 15% soon after the first round of quantitative easing -- and Martenson thinks prices could decline 20% to 50% following the end of QE2. Here's how we can make money after QE2 ends. Find strong company in strong trends. Only bet with the odds. Let's take a quick look at how these steps work together. Then, if you're interested, I'll offer you three strong trends and one money-making trade I've found, along with the trade plan to execute the strategy. "I think that energy stocks are discounting oil prices much lower than where we are trading today." My calculations agree. A recent review of enhanced oil recovery company Denbury Resources' (NYSE: DNR) valuation shows the stock market is pricing in $65-$70 oil versus $98 oil today. That's a big disconnect. Will oil stay near $100 per barrel? Over the long term, there's a strong chance. That's why Sandridge Energy (NYSE: SD) shifted its focus and investment spending away from natural gas to oil over the past few years. It sees oil as the big money maker in the future. But in the short-term, oil prices could easily fall down to $50. And the fear of falling further makes it hard for our brains to bet against the crowd. The Motley Fool believes in the benefits of long-term investing -- and so do I. But like any good craftsman, we can't rely on only one tool to get the job done. 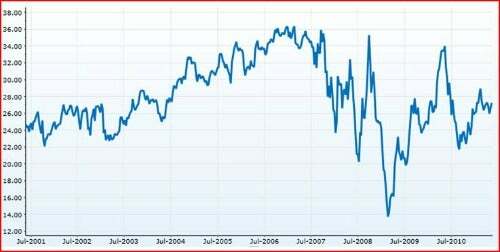 Following the aftermath of the credit crunch of 2009, I expect markets to be volatile over the next three to five years. So trading will be an important tool in every investor's toolbox. BB&T (NYSE: BBT) is a well-regarded regional bank serving customers in Southern states. It's known for its excellent customer service, pays a nice dividend (yielding 2.4% today), and offers a great example. Look at the chart below. For many years, it looked like a stable buy-and-hold company, as did competitor Huntington Bancshares (Nasdaq: HBAN), which really got rocked during the recession. But things changed at the onset of the financial crisis. Investors willing to switch gears and make some strategic trades gave themselves a better chance to make money and avoid taking losses than those who just hung on. No, I am not advocating day trading. What I am saying is that flexibility can be valuable. And today, I think that means being willing to trade a little more often to protect and grow our capital. You may be wondering, "How will I know when to trade and when to hold?" That's a great question. I think the answer depends on how we assess the odds of success, which is exactly why we need a trade plan. Let's take a look at two fantastic companies to try and drive the point home. At the end of 1999, at the top of the technology bubble, Amazon.com (Nasdaq: AMZN) traded at 21.8 times sales, a generous multiple that assumed incredible growth for decades. Two years later, that same disruptive retailer traded for 1.9 times sales. If they held shares today, both investors would have made money. But whereas the investor who bought in 1999 would have doubled his money, the one who bought in 2001 when the odds were more favorable would have earned back his initial investment 17 times! We can see a similar story with another ground-breaking company, salesforce.com (NYSE: CRM). At the end of 2007, as the recession was starting, shares traded at 10.4 times sales. One year later, the price-to-sales multiple dropped to 3.3 before climbing all the way back to 11 at the end of 2010. The lesson is that assessing the odds can help us make better decisions -- and generate higher returns. We don't have to buy precisely at the bottom or sell at the top. That's virtually impossible. But we have to be willing to pass when prices look high and strike when prices look attractive. That's why I always use a trade plan now. Find strong companies in strong trends. Trade when it's better to trade and hold when it's better to hold. Use my trade plan to bet with the odds. In fact, I am investing $50,000 of my own capital using this approach. And I expect to make more than my fair share of money over the next few volatile years. If you'd like to find out about the "3 strong trends and one money-making trade" I mentioned at the beginning, I'll be happy to send you my free report, including the trade plan, absolutely free. Simply click here and enter your email in the box to let me know where to send it.